Amanda dons a tutu for her big performance as a ballerina. Image measures approximately 2-1/4" X 2-3/4". This original design is copyright Ellen Jareckie and House-Mouse Designs. The image is deeply etched and precision cut from premium gray rubber on a 1/8" gray rubber foam backing. Made in the USA. Monica gets a birthday gift from Mudpie. Image measures approximately 2-3/4" X 4-1/4". This original design is copyright Ellen Jareckie and House-Mouse Designs. The image is deeply etched and precision cut from premium gray rubber on a 1/8" gray rubber foam backing then mounted on a cling vinyl decal with full sized image for easier storage and use with an acrylic handle sold separately. Made in the USA. Maxwell is about to pop Amanda's bubble. Image measures approximately 2" X 3-1/4". This original design is copyright Ellen Jareckie and House-Mouse Designs. The image is deeply etched and precision cut from premium gray rubber on a 1/8" gray rubber foam backing then mounted on a cling vinyl decal with full sized image for easier storage and use with an acrylic handle sold separately. Made in the USA. 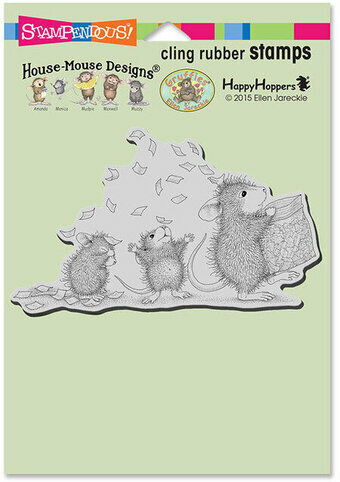 Item #HHQ03 Hop-it is giving some Bunny Luv to Itty Bit in this HappyHoppers image from the pen of Ellen Jareckie. A perfect way to welcome a new baby or say Happy Mother's Day! This quality wood-mounted rubber stamp is made from deeply etched, precision trimmed premium grey rubber. With 1/8" thick grey foam for a smooth impression on uneven or textured surfaces, it is mounted on a contoured hardwood block and indexed with a black image on a full sized decal. The image features original artwork designed by Ellen Jareckie. Made in the USA. Muzzy leads Monica and friends in a candy cane Christmas parade. Image measures approximately 2-3/4" X 4-1/4". This original design is copyright Ellen Jareckie and House-Mouse Designs. The image is deeply etched and precision cut from premium gray rubber on a 1/8" gray rubber foam backing then mounted on a cling vinyl decal with full sized image for easier storage and use with an acrylic handle sold separately. Made in the USA. Mudpie finds a crunchy treat, his favorite kind. Image measures approximately 2-3/4" X 4-1/4". This original design is copyright Ellen Jareckie and House-Mouse Designs. The image is deeply etched and precision cut from premium gray rubber on a 1/8" gray rubber foam backing then mounted on a cling vinyl decal with full sized image for easier storage and use with an acrylic handle sold separately. Made in the USA. Maxwell, Muzzy and Amanda have tricked a friend into giving them a ride! Image measures approximately 5" X 3-3/4". This original design is copyright Ellen Jareckie and House-Mouse Designs. The image is deeply etched and precision cut from premium gray rubber on a 1/8" gray rubber foam backing then mounted on a cling vinyl decal with full sized image for easier storage and use with an acrylic handle sold separately. Made in the USA. Mousey friends enjoy a pleasant lunch. Image measures approximately 2-3/4" X 4-1/4". This original design is copyright Ellen Jareckie and House-Mouse Designs. The image is deeply etched and precision cut from premium gray rubber on a 1/8" gray rubber foam backing then mounted on a cling vinyl decal with full sized image for easier storage and use with an acrylic handle sold separately. Made in the USA. Eight happy greetings of friendship are perfect to use with three little mice. 11 stamp set. 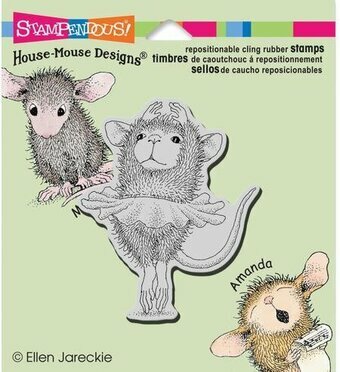 This Large 4" X 6" set of Perfectly Clear Stamps features premium photopolymer images from exclusive artwork copyright Ellen Jareckie and House-Mouse Designs. Interactive images work together for dozens of fun looks. Use with acrylic handle sold separately. Made in the USA. Mudpie and Maxwell enjoy a citrus treat. Image measures approximately 5" X 3-3/4". This original design is copyright Ellen Jareckie and House-Mouse Designs. The image is deeply etched and precision cut from premium gray rubber on a 1/8" gray rubber foam backing then mounted on a cling vinyl decal with full sized image for easier storage and use with an acrylic handle sold separately. Made in the USA. 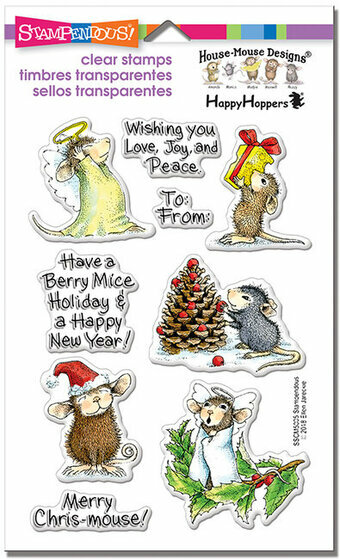 Those fun-loving House-Mouse characters are getting a chance to wish you a Merry Christmas. 9 stamps. 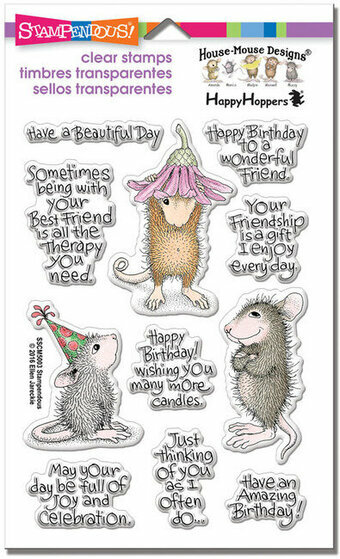 This Large 4" X 6" set of Perfectly Clear Stamps features premium photopolymer images from exclusive artwork copyright Ellen Jareckie and House-Mouse Designs. Interactive images work together for dozens of fun looks. Use with acrylic handle sold separately. Made in the USA. Mudpie gathers some colorful ornaments for decorating. Image measures approximately 4-1/2" X 3". This original design is copyright Ellen Jareckie and House Mouse Designs. The image is deeply etched and precision cut from premium gray rubber on a 1/8" gray rubber foam backing then mounted on a cling vinyl decal with full sized image for easier storage and use with an acrylic handle sold separately. Made in the USA. A broken Christmas Ornament provides a comfortable place for Muzzy and Amanda on a cold Winter night. Image measures approximately 2-3/4" X 4-1/4". This original design is copyright Ellen Jareckie and House-Mouse Designs. The image is deeply etched and precision cut from premium gray rubber on a 1/8" gray rubber foam backing then mounted on a cling vinyl decal with full sized image for easier storage and use with an acrylic handle sold separately. Made in the USA. Get ready for another Maxwell Original. This original design is copyright Ellen Jareckie and House-Mouse Designs. The image is deeply etched and precision cut from premium gray rubber on a 1/8" gray rubber foam backing then mounted on a cling vinyl decal with full sized image for easier storage and use with an acrylic handle sold separately. Made in the USA. Amanda, Monica and Muzzy are Christmas caroling on the tip of a pine tree. Image measures approximately 3-3/4" X 5". This original design is copyright Ellen Jareckie and House-Mouse Designs. The image is deeply etched and precision cut from premium gray rubber on a 1/8" gray rubber foam backing then mounted on a cling vinyl decal with full sized image for easier storage and use with an acrylic handle sold separately. Made in the USA. Amanda is designing originals for Maxwell and Monica. Image measures approximately 2-3/4" X 2-3/4". This original design is copyright Ellen Jareckie and House-Mouse Designs. The image is deeply etched and precision cut from premium gray rubber on a 1/8" gray rubber foam backing then mounted on a cling vinyl decal with full sized image for easier storage and use with an acrylic handle sold separately. Made in the USA. Amanda tosses some confetti to create a party for Monica and a friend. Image measures approximately 2-3/4" X 4-1/4". This original design is copyright Ellen Jareckie and House-Mouse Designs. The image is deeply etched and precision cut from premium gray rubber on a 1/8" gray rubber foam backing then mounted on a cling vinyl decal with full sized image for easier storage and use with an acrylic handle sold separately. Made in the USA.